"This is a very old recipe that I got from a friend. This version of the classic sweet, rich Chess Pie includes evaporated milk and crunchy cornmeal." Just like I remember as a kid! I brought this little taste of the south to Denver and it was a winner! Thanks for the memories. 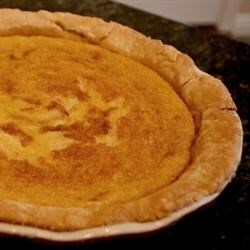 This is one of my favorite chess pie recipes, my grandmother says that it is better than hers and she is going on 80. Chess pie is my favorite and I just love this recipe hands down. JUST MADE THIS PIE, I MADE A FEW MINOR ADJUSTMENTS AND IT TURNED OUT GREAT! I WILL DEFINATELY MAKE THIS PIE AGAIN!! This was delish! I had never had Chess Pie but my husband requested it. It's so easy to make and the custard center was smooth and creamy. Loved it. Thanks!